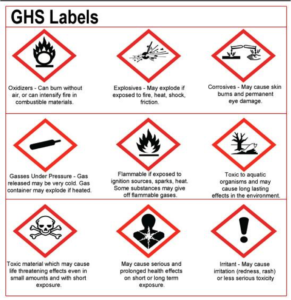 The Globally Harmonized System of Classification and Labeling of Chemicals (GHS) is a set of guidelines to ensure safe handling, transport, use, and disposal of hazardous materials. It was developed by the United Nations as an international attempt to create a uniform system that other countries can use for a universal labeling system. 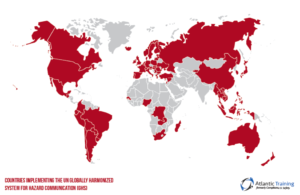 The United Stated adopted the GHS in March of 2012 and over 65 other countries have also adopted. Although the Global Harmonization System is not a law or a regulation, it is a system of recommendations. A co untry who adopts GHS can integrate parts of this system and improve their current regulations. What are the 9 physical hazards? The Department of Transportation (DOT) utilizes similar placards to the 9 GHS guidelines. Over 40 million workers have already been affected by the globally harmonized system. and 5 million industries have also been affected in creating a safe work environment for their employees. 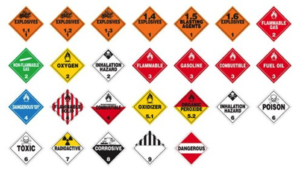 OSHA has combined standards and recreated their Hazard Communication Standard (HCS) to apply the recommendations GHS suggests. In doing so OSHA believes that these revisions will prevent 43 deaths and over 500 work related injuries.